E2new has the equipment in stock that you are looking for or we will find it in the market for you. We offer major brands like ADIC, Brocade, Cisco, EMC, Emulex, Fujitsu, Hewlett Packard, Hitachi/HDS, Hoei Sangyo, IBM, Imation, Microboards, Netapps, Primera, Quantum, SGI, Storagetek and Sun, among others. E2new is a subsidiary of Timberwolf IT Solutions (E2new stands for Equipment2new) and provides new and as good as new equipment. Our company is aiming on the (re-) usage of IT Equipment in a way that it can be justified on technical and economical reasons without doing concessions on quality and reliability. E2NEW is aiming on the delivery and Installation of all IT Hardware that companies require in order to establish their IT Infrastructure without doing any concessions on the agreed Service Level Agreements. Starting point here is that we can make usage of AS NEW or Factory NEW Equipment and in this way we realize in almost all cases a lower TCO for a complete indentical solution that can be offered by traditional partners. You can compare our offer based on the components you define in your request in a complete transparent way with the other competitors. When you need a new or an additional maintenance contract we can work this out with the same philosophy as outlined before. Based on your product specifications we work out a proposal within 24 hours. This is normaly based on buying the equipment but on request it can be based on Rental or Lease for the requested period. For equipment that is or will become obsolete in your company we will find new users/owners. The earlier you can let us know what will become available for sale the better we stand the chance that we will find a new destination for your equipment. Therefor we would recommend E2NEW as a reliable partner for the IT Manager who wants to control his TCO. 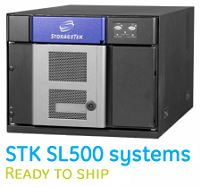 SL3000 tape library units for sale or for rent incl all possible or desired Tape Drives. Units can be delivered and hardware installed including maintenance. We buy most type of USED and NEW Tape Cartridges. We can erase all DATA from your existing Cartridges or Hard Disk ON SITE or in our facility and save money on the total cost of destruction. Call for all your Tape or Disk related questions when you want to sell or buy Tape Cartridges in small or large quantities. Available for SL 8500 in EU serial numbers so eligible for Oracle maintenance. Also in SL 3000 Tray and USA serials.